The sun in Los Angeles set slowly in brilliant displays of pinks and purples fading together almost imperceptibly behind a line of palm trees. 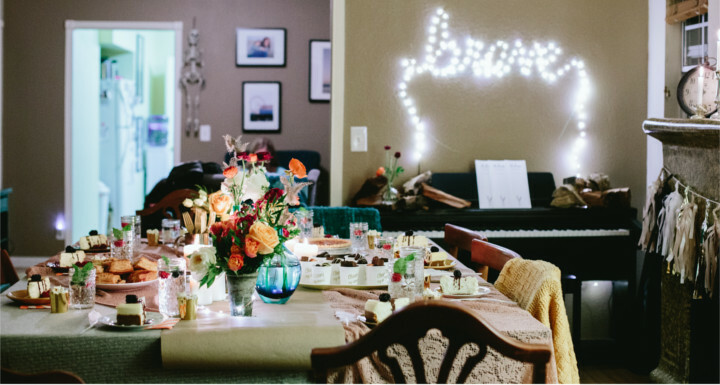 We met in the afternoon to transform a small living room in unincorporated Los Angeles County into a gathering place for brave women. As the sun was setting, our host, Dawn Asher, packed her 6-month-old baby into the backseat of the babysitter’s car. She’d never let her little one ride in a car with anyone beside herself or her husband, and she’d never let anyone else put baby Sicily to sleep. Bravery started even before dinner. Around the table sat a photographer, florist, actor, a mom trying to bring foster children into her family and more. 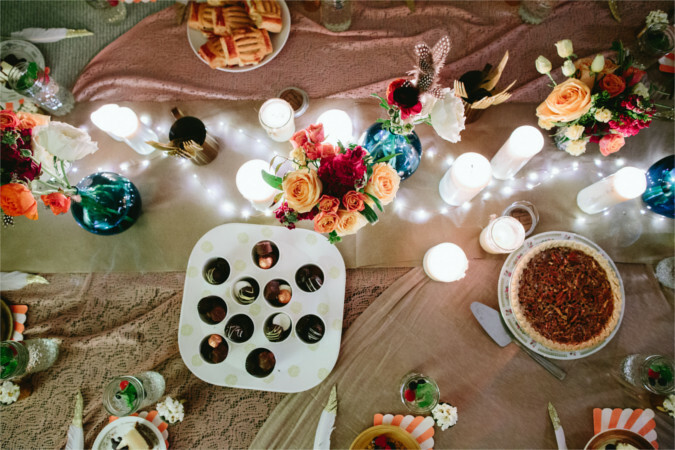 We wanted this Brave Collective to bring together a little piece of all the others we’d hosted around the country and decided to celebrate with desserts from each place. We had chocolates from the Rocky Mountain Chocolate Factory to represent Denver. There was New York cheesecake as a shout-out to the group in NYC. And a homemade pecan pie for the chapter in Nashville. Dawn suggested guava tarts from Portos to represent the City of Angels. It was a celebration of women choosing brave things. In a big city where it’s easy to get lost, it was inspiring to start the conversation talking about the bravest thing each person had done. The conversation was deep and raw and honest. As each of the ladies around the table shared their intended brave, the commitment to encouraging and supporting each other was palpable. 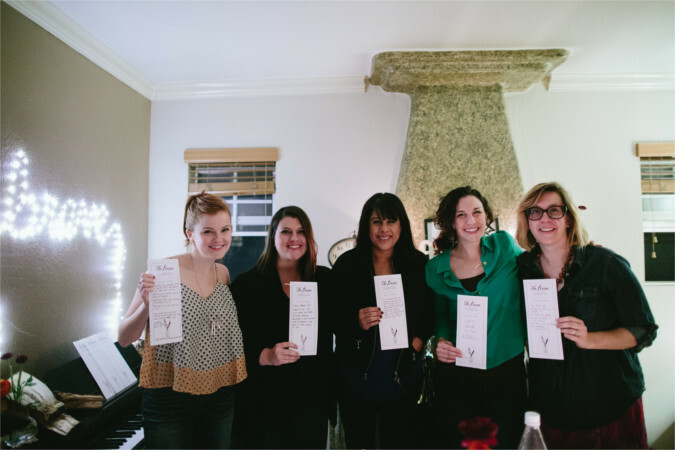 We ended the night with the Brave Collective Toast being said by women all over as they journey into brave things. With the glittered feathers around us, we felt a sense of celebration already stirring for things to come. Grace: Believe I’m worthy by taking care of myself. I want to explore my identity outside being an actress by cooking, following through, receiving love and cultivating my ideas. Sarah: I am going to give myself patience. I am in the process of getting our house ready to take in three foster children which is a little stressful. (That’s an understatement.) I want to be kinder to myself in this process. Laura: I want to be more honest. I mentor younger women and often find myself in a tension of speaking the truth or telling them what they want to hear. I want to be better about saying what is best for them, even if it’s not the easier choice. Dawn: I’m going to get back in the kitchen. Recovery from delivering my daughter was a little traumatic, and I haven’t been able to cook. I love cooking and I’ve attempted it since recovering, but nothing has turned out. I’m going to face my fear of failure to do what I love. Liz: Go outside. I have found myself living a smaller life than I want to be living, and I want to expand. I want to invite people over and cook for them. I want to be involved in my city. I want to play with my family. Design inspiration and receipes for our meal in Los Angeles can be found on the Brave Collective: LA Pinterest board.